"DPD: a girl of nothing but greys"
I finally sat down and watched the last three episodes of Kanon. I've been thinking, recently, about just how long this stupid game and it's related works have been part of my collection of things that effect and influence my work. Kanon has been around for several years, actually - the game originally was released in june of 1999 - i was living in Atlanta at the time. I was starting to see Kanon characters show up in winamp skins, and then in fan art. A friend of mine sent me a AVI file of the opening sequence for the game, and I was hooked. I must have listened to the opening song 'last regrets' a million times. Isn't it funny that i really haven't done much fan art for the series? but then again, you could consider most everything i draw to be a reaction in some way to one series or another. For me, i try to get to the core reason WHY something effects me the way it does. I like to get into why things work the way they do. There is a misconception that in real life I am fluent in Japanese. I am not. I know little more than your average American anime fan (well, maybe a little more). I've been into anime for over 8 years, you'd think i'd be fluent by now, right? Not really. You see, i spent my time learning the language of the art and the expression, not the japanese language itself. I'm still learning too. When you do fan art, you get all the elements of that character or story to help elevate the emotive impact of a drawing - the character you are drawing already HAS a past. Doing original works is harder - you have to give that character a history, a past, something that people can connect with. If you are good, you can do it all with one drawing. You can cheat and do what i do - put a truckload of crappy drawings together to get your point across. Often, for many people, no one else seems to see what you see in a drawing you did. All art is really about putting your feelings down on paper. Learning how to do that so it effectively communicates it to others is a major undertaking. The mistake that people make is that they feel that if it doesn't communicate well to others they should not do it. Don't EVER think that. If it makes you feel something, remember that your frustration with it is that you haven't been able to communicate what you want effectively enough - and doing that takes time. Just don't give up on it. Thats where the frustration in learning to draw comes in - from thought to paper is never as potent as you feel it. Thats why i will never be satisfied with my work. heh, getting a little cryptic there. Gomen. Finishing Kanon just made me think, that's all. It's always made me think. I think they did a great job with the TV series. Sure, it could have been better. Trying to wrap five different scenarios into a single show is gonna leave some of the girls hanging, but it was kind of odd... i actually appreciated the way they tweaked it together. 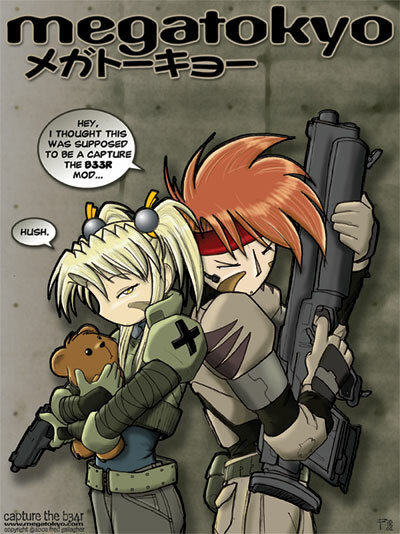 I can't really go into what i liked about it, because that would lead to some spoilers... spoilers for both Kanon *and* Megatokyo, because the reasons why i felt something stir in me that was a reaction to the ending of the show has a lot to do with a strong thread in the MT story. A thread that i still have to refine.